Ellul was, of course, writing about propagandists in politics. But it's shooting fish in a barrel to talk about the applicability of his observations about the new aristocrats to the mass media or to politicians. The proposal of who and what this newer sort of aristocrat the propagandist was seems like it needs to be broadened. Ellul could have just as easily mentioned marketers as the technicians and aristocrats of the age. Anyone in marketing could be construed as part of this aristocratic class. Anyone who would say the content's no big thing and that the marketing and promotion is what matters could be said to either be "in" this aristocratic class or sympathetic to its power. And within the era of unaffiliated self-contained megachurches, a president of a megachurch corporate entity can also be a propagandist, a self-selected aristocrat, master of a massively integrated multi-media platform. So Mark Driscoll can be thought of not only as a propagandist but an aspirant propagandist who, perhaps most remarkably, never hid that this was essentially core to his ambitions from the start. The presentation linked to above was from 2013. Driscoll had managed to land the NYT best seller list through the as yet-unrevealed machination of Result Source. He'd also managed to get quite a following and gain a lot of influence. If you listen to the entire thing you'll hear that it was a presentation on the imperative of content production, distribution, multiplication (read that as recycling the same content across every type of platform for higher impact) and defense. This claim was so dubious on its face to anyone who was part of Mars Hill from, oh, 1995-2013 and paid attention, it warrants a Driscoll-quoting rebuttal. 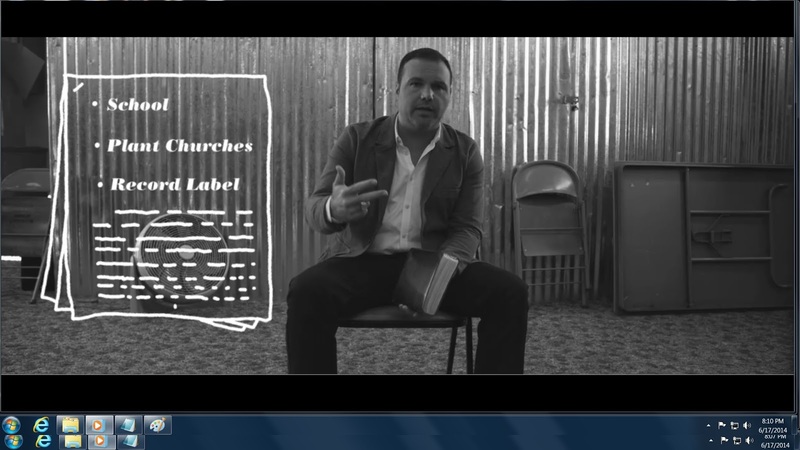 So as multiply attested by none other than Mark Driscoll himself, the goal he had in mind was to start something that would plant churches, make a record label, start an institute, and a few other things. That's a vision of a fully integrated mass media enterprise spanning music and books and academics. That kind of holistic interest in using all forms of technical use of media to drive home a single over-arching vision is kind of looking like that perspective of a propagandist, a little, doesn't it? If we're using Ellul's way of defining propaganda and propagandists then not just Mark but to some degree even Grace Driscoll, too, could be described as a couple that aspired to attainment in what Ellul called the aristocratic class that would control media and become a threat to the healthy function of democracy. To go by the way governance inside Mars Hill spun out into what seemed to be an increasingly autocratic and secretive regime of a megachurch what Ellul had to say about propagandists in politics may have proven equally true of propagandists who are more officially called megachurch pastors. To make a myth of democracy is to present the opposite of democracy. We have seen how all propaganda develops the cult of personality. This is particularly true in a democracy. There one exalts the individual, who refuses to be anonymous, rejects the "mass," and eschews mechanization. He wants a human regime where men are human beings. ... To be sure, the object at this level is not idolatry, but idolatry cannot fail to follow if the propaganda is done well. Whether such idolatry is given to a man in uniform bursting with decorations, or a man in work shirt and cap, or a man wearing a business suit and soft hat makes no difference; those are simple adaptations of propaganda to the feelings of the masses. It doesn't matter whether the cult of personality is around Trump or Sanders or Clinton or some other candidate. Now in the 1960s it's hardly lost on any of us, half a century later, there was still a whole lot of racism and sexism and so on. Even so, if we live in an era in which someone could wistfully pine for a world in which there could be sixteen consecutive years of all Republican or Democratic governance, if we have people who presume that whoever the other team has can't and doesn't have anything but bad ideas then in the age of the internet we've got people whose only acceptable understanding of whatever democracy is has calcified into a civic religion that is either red or blue. Some of them will bend over backwards to ensure that whatever formal religion they espouse more adequately meshes with their economic and political convictions. Ellul, though he may have dropped the ball in assuming just how tolerant people were, may have been forecasting politics in the age of Facebook with this next point. But the creation of the etiological myth leads to an obligation on the part of democracy to become religious. It can no longer be secular but must create its religion. Besides, the creation of a religion is one of the indispensable elements of effective propaganda. [emphasis added] The content of this religion is of little importance; these feelings are used to integrate the masses into the national collective. We must not delude ourselves: when one speaks to us of "massive democracy" and "democratic participation," these are only veiled terms that mean "religion." Participation and unanimity have always been characteristics of religious societies, and only of religious societies. The narratives of the rise of the radical right or the left can serve as remarkably robust stand-ins for a Fall narrative a la Genesis 3. Gather around children and let me tell you how the evil Democrats/Republics/socialists/capitalists destroyed a cosmic harmony that never really existed but that we will posit we could arrive at if you vote the way we think you should. There may well be blue state and red state forms of civic Christianity but to those ends Christ has been invoked to underwrite a progressive or conservative aim that is thoroughly American in its interests. To turn to Sanders or Clinton or Trump or anyone else at this point is to identify your idol. Americans who take to the internet seem eager, too eager, to ensure that the version of Jesus that is the real Jesus (however we'll define that) is one that fits their aims. But then a corresponding move happens even in completely secular terms. The god is replaced with confidence in mass behavioral paradigms, whether socialism or capitalism. The core is not necessarily less totalitarian in emotional impetus for eschewing deities. ... An additional effect of contradictory propaganda is that the individual will escape either into passivity or into total and unthinking support of one of the two sides. It is striking to see how this current, which is the point of departure of totalitarian parties, is beginning to take hold in the United States. These two different reactions--passivity or total commitment--are completely antidemocratic. But they are the consequence of some democratic types of propaganda. He is the hub of the problem. Propaganda ruins not only democratic ideas but also democratic behavior--the foundation of democracy, the very quality without which it cannot exist. It seems Ellul was right to warn that democracy is a form of governance would not be able to withstand regular deployment of propaganda, and that democracy as a form of governance might find its most terrible adversary not so much in alternative political paradigms in real-world practice but in the transformation of democratic life into a foundational myth. Democracy as a religious faith absent any belief in a deity might be the real problem. Everybody wants to believe in democracy until, as Ellul put it, people pick stuff that people with democratic ideals don't want. Ellul dryly remarked that the people who seem most perplexed and incensed that anyone would pick something not democratic as they see it are the Anglo-Saxon democratic types. Nobody was more shocked that not everyone wanted democratic life than WASPs. Over the last twenty years I've heard some conservatives say that Bill Clinton was going to suspend the Constitution, declare martial law and declare a national emergency in which he'd be leader for life. Of course Bill Clinton came and went. Then George W. Bush ended up in office and as his time neared an end I'd hear some others say that Bush was going to suspend the Constitution, declare martial law and declare a national emergency in which he'd be leader for life. Somehow that didn't quite happen, either. But what did happen was that people on the red and blue sides convinced themselves that the other team was all set to transform America into a totalitarian state. What if those are the kinds of people who in their emotional and intellectual lives are already making the United States, in some peculiar domain of the heart, a totalitarian state? The scapegoats may change but scapegoating doesn't. Think of it, that was published in 1965 and Ellul hadn't even lived long enough to see people talking about politics on Facebook! So somehow something changed between 2014 and 2015. Mark Driscoll went from saying for himself and the leaders of Mars Hill that they weren't entirely sure who people were to reconcile with because things were done anonymously on the internet to telling people at the Thrive conference there was a conflict going back to 2007 that had been ongoing for eight years. We'll have to get to two aspects of the initially quoted comment from Driscoll. Were all the parties anonymous, first of all? And were the parties making their grievances known through the internet or were they availing themselves of other avenues? There's a third element introduced by the Thrive narrative, which was Driscoll's claim that there was a conflict that lasted eight years that "really went public the last year". It didn't go public in 2014 or 2013. It was publicized by the Stranger in 2007 the year it happened, and Joyful Exiles was up as of March 2012. But we can even set that off to one side. Consider, if the 2007 re-organization and firings were the controversy Driscoll was alluding to, whether or not it could be considered an eight year continuous conflict. Driscoll didn't exactly sound like he thought it was a conflict anymore when he said "There is a pile of dead bodies behind the Mars Hill bus" in October 2007, did he? As the saying goes, you can't eat your cake and have it, too. Either Driscoll knew who these unnamed parties were going as far back as 2007 or some other date, or he didn't. "... you haven't produced a lawsuit in over a year. In fact no one has filed a lawsuit." No prize for who Dean was taunting, the marvel of that taunt was that it showed, in March 2015, that Justin Dean knew there was the possibility of a lawsuit and he knew of it being a possibility for more than 12 months before March 9, 2015. That timeline fits with about April 2014. Last spring, in this case, looks like the spring of 2013. In other words, Justin Dean seemed to know from the earliest contacts from Fahlings office who he was dealing. Sutton Turner even mentioned the date former members of Mars Hill sent a legal request to preserve documents with the mention of a potential suit. Sutton Turner knew since at least April 2014 that parties led by a former Mars Hill member had concerns. Even if Mark Driscoll had insisted on using a royal 'we' to say "We're not entirely sure who they are". Scott Harris sent Wenatchee The Hatchet a certified letter on December 4, 2013 that said, "I have seen a few of your blog posts regarding Mars Hill Church. I would love to sit down with you and talk about them." That's not even counting an unsolicited email from another campus pastor from about October 2013. A campus leader that could send a certified letter in 2013 to Wenatchee The Hatchet, who had stopped renewing Mars Hill membership around 2007 (and let's keep in mind that at this point Mars Hill attendance was in tens of thousands across the western US) how plausible is that that Mars Hill leaders couldn't work out who to reconcile with from among their own former elders and deacons, exactly? Take all the statements from Mars Hill leadership in the last six years and other correspondence quoted above and read them as a continuous arc and it seems impossible to reach the conclusion that Mark Driscoll, Sutton Turner or Justin Dean had no idea at all who they might have been dealing with. It's not like Brian Fahling didn't send letters. It turns out from Fahling's correspondence some kind of overture of interest in mediation was made as far back as the spring of 2013. Now Mars Hill leadership was certainly at liberty to decide they didn't WANT to meet for mediation but to say at any point in the last two to three years "we're not entirely sure who they are" comes off like a bold-faced lie.. The cumulative statements of guys like Justin Dean and Sutton Turner seem to indicate they knew pretty well who they were opting to not deal with. Driscoll himself couldn't have invoked references to a conflict from 2007 if he didn't have some idea there were parties involved whose time at Mars Hill even went that far back. So if by the account of none other than Sutton Turner it was possible to know who the interested parties were who had concerns about Mars Hill as far back as April 2014 how on earth would Mark Driscoll not know who those parties were? Why would the secretary of the corporation know something and not pass it along to the president? To put it another way, if the secretary knew why would the president not know? If the PR head of Mars Hill knew why would the president not know? If Driscoll could say in 2015 that a conflict that happened 8 years prior only became public in 2014 then even if we set aside the impossibility of that claim being true based on matters of public record, wouldn't that in itself imply that Driscoll did know some of who these people were? That knowledge, if corresponding to whatever reality is, makes it all the more impossible for Driscoll to have honestly said "we're not entirely sure who they are". While Driscoll did not respond to a request for comment from The Christian Post by press time, the ECFA issued a statement to CP noting that the individuals bringing the lawsuit "have no direct knowledge of the ECFA's accreditation process" and are "wrong" about the ECFA's involvement with Mars Hill Church. "Neither ECFA nor any of its employees are named as parties in a private lawsuit that has been brought against the leader of a formerly accredited ministry," said ECFA, which highlighted that it was not sued but was instead listed as a co-conspirator. [emphasis added] "It also appears that the individuals bringing the lawsuit have no direct knowledge of ECFA's accreditation process and have the facts wrong regarding our involvement with the ministry in question." That is technically very true. ECFA's just named as one of the non-party co-conspirators not a party. Since apparently plenty of people read about the 42-page filing rather than the filing itself perhaps we should consult it? 12. Certain other non-party individuals and business entities, as set forth below, played roles, direct or indirect, in RICO Defendants scheme to defraud the Jacobsens, Kildeas, and other MHC members and non-members who donated monies to MHC in response to RICO Defendants’ fraudulent solicitations. h. Evangelical Council for Financial Accountability (“ECFA), Winchester, Virginia. (6) At all times relevant hereto, from September 2012 forward, ECFA accredited MHC in spite of RICO Defendants’ ongoing and habitual pattern of racketeering activity involving RSI, the Global Fund, Campus Fund, and the Jesus Festival. and so is Dan Busby, president of the ECFA. But for that you should go read the whole thing for yourself. That's pretty sweeping and lacking in nuance. After all, it was back on March 7, 2014 the entire Board of Advisors and Accountability (which would have included Mark Driscoll, yes?) confirmed the use of Result Source to rig a place for Real Marriage on the New York Times bestseller list. It's not clear that Mars Hill leadership has ever disclosed the "true cost" of the project or why it was less than the number obtained from written agreements. Mars Hill Church Investment Fund, LLC has officially become inactive. The Mars Hill Foundation for Planting Churches, is not inactive and doesn't hit its expiration date until much later this year. Mars Hill Church itself is not yet listed as inactive. On Mission Charitable Remainder Unitrust is the governing person. Box 527? That's different from the Box 434 of The Trinity Church but it is the box for Mark Driscoll Ministries. So OMCRU Investments LLC in Arizona has the same mailing address as Mark Driscoll Ministries. The Seattle Times reports the lawsuit alleges Driscoll and Turner used church money to fund Driscoll's book Real Marriage. Defendant Brian Jacobsen launched a GoFundMe page last April to fund the suit. The lawsuit could set an interesting precedent. Brian Fahling, an attorney representing plaintiffs Brian and Connie Jacobsen and Ryan and Arica Kildea [emphasis added], two married couples, said he knew of only one other lawsuit involving racketeering allegations against religious figures. I already thought Charisma was pretty much worthless in journalistic terms but this kind of mistake is breath-takingly bad even from them. This article does quite a bit better. Although, there's no allegedly about the William Wallace II pseudonym Driscoll took up. Since contributors to Think Progress might understandably not have Driscoll books laying around that "allegedly" is a relatively safe way of phrasing things. For those who want to read all of the preserved writings of William Wallace II that managed to be preserved there's a tag here for you. and for the contents of "Pussified Nation" and a social/historical survey of what was going on here in the Seattle area at Mars Hill when Driscoll instigated the thread ... here's a set of tagged posts for that. it has a partial screen cap and the text was from a text file someone saved of the rambling conversation that Wenatchee The Hatchet preserved. So there's no doubt Mark Driscoll took the name William Wallace II. Since we've hit the tenth anniversary of Confessions of a Reformission Rev this year, it was worth pointing out earlier this month that while many have asserted that Mark Driscoll apologized for the stuff he said under the pen name William Wallace II this wasn't the case. He didn't actually say or write that he was sorry for what he said in substance, he may have expressed some remorse over his tone. The following post explored what Driscoll and others actually said about the Pussified Nation/Dead Men era and there was more talk about gay guys going straight; God drawing straight lines with crooked sticks; and Mark talking about the great stuff God did back in the day than expressing any regrets about the substance of what Driscoll said under his pen name. While Christians have too often been skeptical about secular/progressive coverage (which has had more than its share of mistakes reporting things about Mars Hill, to be sure), it's shameful that Charisma could botch a statement about the recently filed RICO suit that's so basic anyone who actually looked at the filing could see Jacobsen was listed as a plaintiff and not a defendant. Mark DeMoss, who for many years served as chief of staff to Falwell Sr. and considered the televangelist a second father, said in an interview that it was a mistake for Falwell Jr. to endorse Trump. He said the Republican front-runner’s insult-laden campaign has been a flagrant rejection of the values Falwell Sr. espoused and Liberty promotes on its campus. DeMoss is listed as a supporter of Mark "there is a pile of dead bodies behind the Mars Hill bus" Driscoll. Now even if someone were to say that William Wallace II was all an act, a parallel between Trump and Driscoll isn't implausible. Both men built careers as public figures sounding off on various topics via screens with a week or so for editing as an interval. Anyone recall that in the earliest coverage of Driscoll he was willing to joke that he was to the right of Pat Buchanan on politics? Not that I'm particularly gung-ho about either Mark Driscoll or Donald Trump as public figures. You can love `em both or find them both troubling but to pick one and not another? It's possible ... but perplexing. Normally posts don't get republished/recycled here at Wenatchee The Hatchet. Exceptions occur, however, and in this case the exceptional circumstance is that the audio that shall be quoted below is available to download now so that you, dear reader, can compare notes of the transcription to the actual audio. So without further ado, we'll return to the originally posted content, but this time you can download the audio and listen to Driscoll for yourself at the time markers indicated in the blog post. Yes, there'd been rumblings and murmurs for a couple of years. It wasn't worth writing about while it was just rumblings and murmurs. Now that an actual complaint has been filed, however, there's something to write about. In an earlier post we revisited an old Mark Driscoll tweet about forgiveness. Forgiveness is not covering up sin committed against us. If a crime is committed, you can forgive someone & still call the cops. Well, as of February 29, 2016 a RICO suit has been filed against officers of the non-profit corporation that was Mars Hill. That July 19, 2014 statement post-dated WORLD's coverage by a few months, obviously. Joyful Exiles first appeared in March 2012. If campus leadership at Mars Hill was attempting to contact Wenatchee The Hatchet by certified letter as far back as December 2013 and WtH wasn't even a former staff member or leader, then surely during a season (May 2013) in which the BoAA sent letters to more than 100 former staffers it could have been possible to figure out who would have sent that letter from April 2014. Unfortunately, Mars Hill’s attorneys have requested that I not blog. I have removed some of the financial information as well as other non-financial information in response to their request. Now it's certainly possible to not trust what Turner wrote but by his account he was contacted by attorneys for Mars Hill and told to remove financial information related to the topic of Mars Hill Global, apparently. They also requested that Turner not blog. It may be something to keep in mind about how long things have taken to get to a point where a RICO has been filed, whether or not anything actually comes of the RICO being uncertain. So maybe for a guy like Mark Driscoll forgiveness is a gift you give to yourself to move on with your life, and maybe forgiveness still provides the liberty of calling the cops if a crime has been committed. Well, in that taxonomy of forgiveness it may be possible to forgive someone but still file a RICO suit against them. It has been fascinating to read with some regularity in the last year and a half who has been willing to sound off on what took place at Mars Hill. While some have noted that bloggers have deigned to write about things going on who never attended a service or were even a member, it has hardly stopped outlets like the Christian Post from letting people do precisely that. There wasn't necessarily a complaint from those who have talked about "bloggers" when pastors who may have never set foot in Mars Hill decide to do guest pieces for the Christian Post, was there? Perhaps there was. Well, let's take a relatively recent piece by Shane Idleman for the Christian post. It may be provided as a case study for when a pastor who has no clear or obvious connection to the history of Mars Hill does what many a pastor is tempted to do, sound off in abstractions about a recent event that may or may not have any discernible connection to the soapbox points. In general I find it impossible to take seriously articles in which numbered lessons are provided that we can learn from some recent event. All too often it can seem that the lessons to be learned were axioms the author was going to lay on the reader anyway regardless of the month's headlines. In my case, I was allowed to make the most of my mistakes in the secular world before planting a church at age 41. Mark Driscoll was not afforded this luxury — he entered the pulpit in his 20s and had to work through anger, pride and control (by the way, most church planters struggle with these traits, myself included). I'm not defending, or criticizing, I don't have enough information to truly speak to the issues on either side [emphasis added], but I want to remind all of us that Christians are fallible and make mistakes. We should consider the total portrait of one's life, character and ministry and evaluate on that basis. A few poorly chosen statements, angry outbursts or controlling decisions made over the course of many years shouldn't define a person. One's life and character speak volumes as to the sincerity of his or her ministry. We should extend to others the same grace that we desire and be patient with others. I am deeply saddened by the spiritual condition of many Christians. We love to be armchair quarterbacks and diss pastors and Christian leaders, yet we have no idea of the demands they encounter and the pain they feel. Our sinful tendency is to pull others down. We may think that somehow this makes us look better. If we are truly concerned about the body of Christ, we will hold our tongue. Self-righteousness has no place here. But I'm not referring to sweeping corruption and deception in the church under the rug. Wisdom is needed here. and ... sadly not on display. No one who was heeding the advice in the way it seems to have been intended could have, with much integrity, have both written and submitted that piece to the Christian Post for publication. Even if Idleman were someone with whom Driscoll himself had shared a meal at some point that wouldn't obviate the go-to-verse for so many Christians, Proverbs 18:17. As it stands, the foolishness of the entire post announces itself to a person who has any familiarity with Proverbs. If you can't speak to the facts of any of the sides who participated in the history of Mars Hill then it's foolish to decide to use Mars Hill and Mark Driscoll as an occasion to cycle through content that doesn't need a news peg. Those sorts of pious bromides don't need news pegs anyway. If Idleman missed the stretch of later 2013 to early 2014 perhaps he missed the plagiarism controversy or the Result Source controversy. Or perhaps Idleman wasn't aware of Joyful Exiles or Repentant Pastors or Tripp's comments that were made available for public consideration about Mars Hill having the most abusive ministry culture he'd ever seen. Perhaps he hadn't noticed in 2015 that former executive elder Sutton Turner remarked on how he objected to Result Source but signed it anyway? But, as previously noted, the kind of piece Idleman opted to write is the kind that can be plugged in for any suitable occasion. It isn't necessary to know any of the details or even the generalities of what happened. If anything it's probably preferable to not know much at all so as to have a reason to publish something that, were a person to know more of the situation at hand, might otherwise seem reckless, like grabbing the ears of a dog as you're happening to walk by it. It was very much like a death and I just want to say, right off the top, I'm so sorry, and I know that what happened at Mars Hill hurt so many people and a lot of people are disillusioned today about church. I know a lot of people left Mars Hill in Albuquerque and some found other churches, which we're really thankful for. There are some great churches in Albuquerque so we're certainly sorry that people aren't at North Church that have left but we're glad that they've found places. But I'm really concerned for the people that have just become disillusioned with church and moved on and I want those folks to know that I am so sorry. So by Dave Bruskas' account the death of Mars Hill was severely damaging to a lot of people to whom he wanted to say sorry. Bruskas also described Mars Hill as dying primarily because its leadership culture was broken. These were people who had not learned how to do ministry the right way and did ministry in a broken way. Now you are free to dissent from Bruskas' account or have doubts about his sincerity but what even Bruskas considers beyond dispute at this point is that Mars Hill died because of a leadership culture that had become so toxic the death of Mars Hill was, as we've all seen, pretty much inescapable. Ironically, if Idleman wanted to make a point that Christians shouldn't read blogs or indulge "critical" statements about church leaders he may have picked the wrong case study. Bruskas' description of how and why Mars Hill died is surprisingly congruent with Wenatchee The Hatchet's longstanding conviction that while there have been plenty of sincere and faithful Christians at Mars Hill who wanted to be a positive influence within the Puget Sound area the leadership culture had grown too toxic and dangerous for the institution known as Mars Hill Church to end up being a healthy institution or culture. Compared to Mark and Grace Driscoll in 2016 thus far, at least, Bruskas is willing to admit he was a pastor at Mars Hill. For those who read the 42-page complaint this week, Bruskas is listed among non-party co-conspirators.